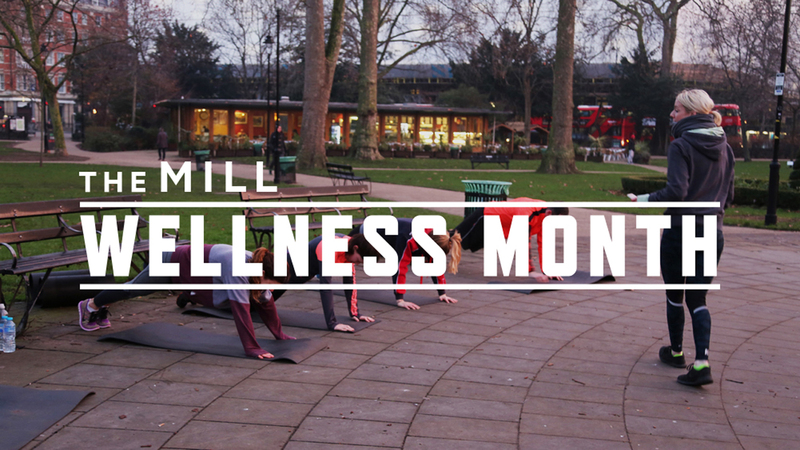 After a successful festive period, filled with plenty of giving, merriment and treats for all at Windmill Street, The Mill's London studio underwent a detox and began 2017 with ‘Wellness Month’; to inspire staff and clients alike to get more in touch with their well-being this year. Throughout the London studio, a calendar of month long healthy initiatives were launched to kick start the new year. DIY smoothie stations were installed across all floors with inspired mixes and fresh ingredients, whilst the schedule also included a range of activities, talks, and pop-ups. Tuesday morning’s saw The Mill’s very own producer and personal trainer Bethaney Phillips host her ‘Beth’s Bootcamp’ in Russell Square Park. These hour-intensive fitness sessions had people trying their hand at Circuits, Padwork, HIIT and Functional Training. For those who desired something a little less intensive, FRAME London hosted a Loft takeover every Friday throughout the month, bringing with them their highly regarded ‘Yin Yoga’ and ‘Bend It Like Barbie’ stretch sessions. The Mill also hosted a series of talks and workshops, covering subjects such as mindfulness, sleep, and stop-smoking sessions across the four weeks. Rebel Kitchen rounded off the calendar of events, on hand from 12pm-6pm in the Loft on Thursday 26th of January serving their guilt-free coconut-water hot chocolate.